Sakata Shonai (酒田・庄内) has many traditional and historic sites. 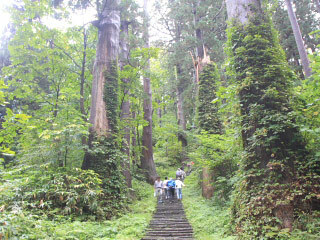 Dewa-sanzan, the three great shrines of Yamagata, is one of the most popular tourist spots in Tohoku region. Also, Sakata and Tsuruoka has many traditional buildings that offers great tourism of classic town of Japana. This area also has many beautiful nature of both mountains and sea. Mt. Gassan and Mt. Chokai is one of the best mountains in Tohoku, and sea food in this area is great! In the winter, it has a lot of snow. This area is known as heavy snow reagion. Also, wind is very strong. With those wind and water of snow, it has a great rice field. Use Tohoku Express Way to Yamagata Express Way to Nihonkai Tohoku Express Way. Exit at Sakata. Use JR Senzan Line to Yamagata Station. Change Yamagata Shinkansen to Shinjo Station. Change JR Okunohosomichi Mogami Line to Meamaru Station. Change JR Uetsu Line to Sakata.